After you configure an Aurora Serverless DB cluster, you can modify its scaling configuration with the AWS Management Console, the AWS CLI, or the RDS API. You can set the minimum and maximum capacity for the DB cluster. Each capacity unit is equivalent to a specific compute and memory configuration. Aurora Serverless automatically creates scaling rules for thresholds for CPU utilization, connections, and available memory. You can also set whether Aurora Serverless pauses the database when there's no activity and then resumes when activity begins again. Minimum Aurora capacity unit – Aurora Serverless can reduce capacity down to this capacity unit. Maximum Aurora capacity unit – Aurora Serverless can increase capacity up to this capacity unit. Pause after inactivity – The amount of time with no database traffic to scale to zero processing capacity. When database traffic resumes, Aurora automatically resumes processing capacity and scales to handle the traffic. 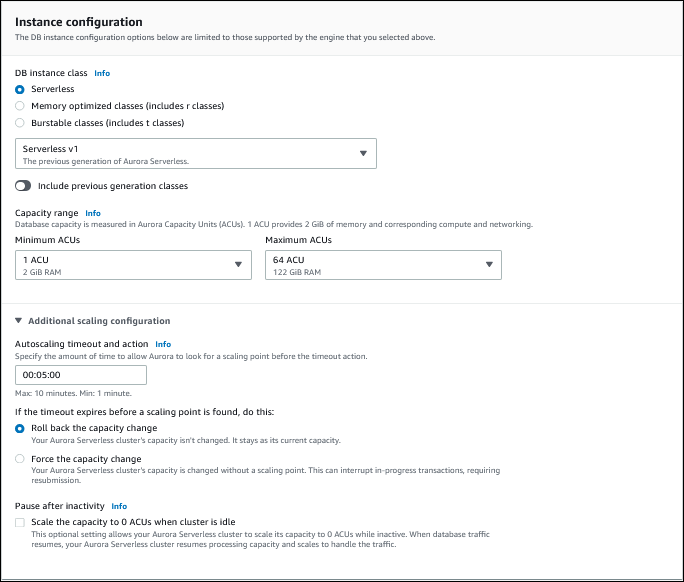 You can modify the scaling configuration of an Aurora DB cluster with the AWS Management Console. In the Capacity settings section, modify the scaling configuration. To modify the scaling configuration of an Aurora Serverless DB cluster using the AWS CLI, run the modify-db-cluster AWS CLI command. Specify the --scaling-configuration option to configure the minimum capacity, maximum capacity, and automatic pause when there are no connections. Valid capacity values are 2, 4, 8, 16, 32, 64, 128, and 256. In this example, you modify the scaling configuration of an Aurora Serverless DB cluster named sample-cluster. You can modify the scaling configuration of an Aurora DB cluster with the ModifyDBCluster API action. Specify the ScalingConfiguration parameter to configure the minimum capacity, maximum capacity, and automatic pause when there are no connections. Valid capacity values are 2, 4, 8, 16, 32, 64, 128, and 256.